Mushrooms bring back memories of childhood mushroom foraging expeditions which took place in Victoria’s Dandenong Ranges and Daylesford. The Russians (my parents and their friends) would organize mushroom foraging day trips which were quite the epic event. They would pack days in advance and the cooking for the following Saturday’s picnic and additional meal and tea breaks would begin on the weekend prior. After all, it would be unthinkable to go on a mushroom foraging expedition and not pack at least several three course meals to get you through the day. As I was a child, I was forbidden from picking any mushrooms should I accidentally pick something either poisonous or hallucinogenic (I couldn’t imagine a bunch of middle-aged Russians tripping, they’re bad enough drunk). I was however allowed to carry the cane basket the precious mushrooms were transported in. I was also naturally allowed to eat myself silly on the picnic feast which was usually spread out on a patch of grass in a field or on the side of the road. Everyone would be eager to see how many mushrooms everybody else had foraged and there was much conversation about how the bounty should be cooked. There would be mushroom marinating and pickling, mushroom piroshki (a small Russian pie), mushroom pirog (a big Russian pie), mushrooms would be folded through steamed buckwheat kasha and many a ‘shroom would be sautéed with butter to make its way into a delicate crepe. Perhaps some even made into a soup like this one. Whilst I’m not suggesting you go out and forage for your mushrooms (in fact I would advise against it), I do suggest using Swiss Browns and the odd Porcini. Regular supermarket button mushrooms deliver a tasty end result as well, though for me a mix of all of them is my usual choice. The zucchini addition came about one day when I was cooking this soup and I found a lonesome slightly wilted looking example in the bottom of the vegetable crisper and tossed it in with the cooking mushrooms. From that point on I made the zucchini a permanent addition to the recipe. 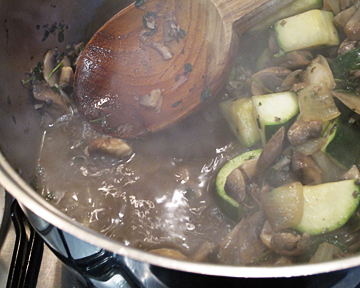 Zucchini not only thickens the soup which can be on the watery side if using mushrooms alone, it also adds flavour. Not bad for a notoriously bland bit of veg. As for the thyme, well, as far as I’m concerned mushrooms and thyme are a match made in heaven. Whether you are cooking a special soup course for a dinner party or using up mushrooms bought on special at the market, this soup is satisfying, delicious and easy to make. Good to serve with some buttered dark rye sourdough (or gluten-free bread) and to eat whilst daydreaming of your own mid-summer mushroom forage. Prep time: 20 mins, cooking time 30 mins. Serves 4-6 as a main meal. 1. Melt the butter in a medium sized heavy base pan over medium heat and cook your onion and garlic until softened and translucent, approximately five minutes. Add your mushrooms, thyme and bay leaves and cook for approximately five minutes. Then add your zucchini, cooking until the vegetables release their juices, approximately 10-15 minutes. 2. Add the stock to the vegetables and bring to the boil then immediately reduce the heat and simmer for five minutes. Add your cream and stir through, simmer another five minutes. 3. Remove the thyme sprigs (if used) and bay leaves from the soup and process with a stick blender. If your soup is a little runny, you can thicken it by dissolving one teaspoon of tapioca or cornstarch in half a cup of water. Add this slowly to your soup on low heat whilst stirring well. Take care not to over-thicken. It is my intention for the photography on this blog to use as many found objects and secondhand items as possible. The background used in the mushroom soup shot is an old weathered piece of plywood found in a hard rubbish council clean up near my house. The old chopping board was procured in the same fashion and was further weathered by giving it a good scrub to remove the decades of built up dirt on it. The green netted mat was also found in hard rubbish, all other props were found in local charity shops except for the linen tea towel which is from Etsy seller Knock Knock Linen. The only light used in these images is window light. Beautiful! It is simmering as I type, can’t wait to try it! What a great recipe. It’s simmering away nicely and the aroma through the house is making me hungry. The one thing I did differently was in lieu of adding 4 cups of stock in I added the same amount of stock but in only 2 cups as I added a lot of extra zucchini to provide the extra juice to compensate.